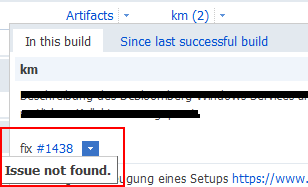 I have a problem with the bugzilla connection configuration in TeamCity 5.1.4 Professional Edition. First of all, I have read the Issue Tracker Configuration Section in the TeamCity Documentation, but it does not answer my question. Our Bugzilla is available via https - connection. So I have to do a web authentication first, and in a second step the Bugzilla login. Bugzilla-XML-RPC is activated. My question is: How can I connect a Bugzilla Service through https? I have tried to add the https auth information to the Server URL. But this does not work for the Test connection. The Issue Id Pattern seems to be okay, because a mouse-click on the link below shows Bugzilla issue #1438 in the web browser. The issue exists, but the issue details won't be displayed. It would be great if you have any suggestions for me how to configure a Bugzilla connection with web authentication correctly. Can you please enable debug logs, reproduce the issue, then disable the debug logs and attach the related piece of the teamcity-server.log? The debug logging can be enable on Server Configuration > Diagnostics. I have replaced my password and the hostname in the logfile with dummy strings. I suppose that I add the .htaccess credentials (user: km, password: mysecretpassword) in a wrong way, or this credentials won't be used by TeamCity. 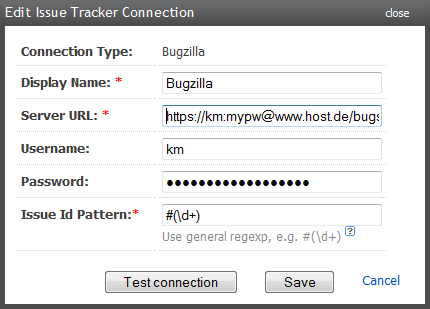 [2010-09-20 11:43:05,869] INFO - eTracker.AbstractIssueProvider - Failed to fetch the issue: 1439, reason: HTTP server returned unexpected status: Authorization Required, connection: "Bugzilla"
[2010-09-20 11:43:05,902] INFO - eTracker.AbstractIssueProvider - Failed to fetch the issue: 1395, reason: HTTP server returned unexpected status: Authorization Required, connection: "Bugzilla"
[2010-09-20 11:43:05,913] INFO - eTracker.AbstractIssueProvider - Failed to fetch the issue: 1409, reason: HTTP server returned unexpected status: Authorization Required, connection: "Bugzilla"
[2010-09-20 11:43:05,923] INFO - eTracker.AbstractIssueProvider - Failed to fetch the issue: 1401, reason: HTTP server returned unexpected status: Authorization Required, connection: "Bugzilla"
[2010-09-20 11:43:41,104] INFO - eTracker.AbstractIssueProvider - Failed to fetch the issue: 1439, reason: Cached issue for https://km:secretpassword@www.mybugzillahostname.de/bugs/show_bug.cgi?id=1439 is null (probably failed to fetch it previous time), connection: "Bugzilla"
[2010-09-20 11:43:41,531] INFO - eTracker.AbstractIssueProvider - Failed to fetch the issue: 1439, reason: Cached issue for https://km:secretpassword@www.mybugzillahostname.de/bugs/show_bug.cgi?id=1439 is null (probably failed to fetch it previous time), connection: "Bugzilla"
[2010-09-20 11:43:41,532] INFO - eTracker.AbstractIssueProvider - Failed to fetch the issue: 1439, reason: Cached issue for https://km:secretpassword@www.mybugzillahostname.de/bugs/show_bug.cgi?id=1439 is null (probably failed to fetch it previous time), connection: "Bugzilla"
[2010-09-20 11:43:41,534] INFO - eTracker.AbstractIssueProvider - Failed to fetch the issue: 1439, reason: Cached issue for https://km:secretpassword@www.mybugzillahostname.de/bugs/show_bug.cgi?id=1439 is null (probably failed to fetch it previous time), connection: "Bugzilla"
Please remove credentials (login and password) from the server url, enable debug mode and try Test connection again. Please attach log after that. I have excactly the same problem as Kim, but with TeamCity 6.5.4. When I try to access the url https://myuser:mypassword@seu.sdm.de/pu/edlsencore/bugzilla/show_bug.cgi?ctype=xml&id=1500 with a browser it works. When I try it with the issue tracker dialog an authentication error occurs. check your user-id and password and try again.